This article is about weathering of rocks and minerals. For weathering of polymers, see Polymer degradation and Weather testing of polymers. Weathering is the breaking down of rocks, soil, and minerals as well as wood and artificial materials through contact with the Earth's atmosphere, water, and biological organisms. Weathering occurs in situ (on site), that is, in the same place, with little or no movement, and thus should not be confused with erosion, which involves the movement of rocks and minerals by agents such as water, ice, snow, wind, waves and gravity and then being transported and deposited in other locations. Two important classifications of weathering processes exist – physical and chemical weathering; each sometimes involves a biological component. Mechanical or physical weathering involves the breakdown of rocks and soils through direct contact with atmospheric conditions, such as heat, water, ice and pressure. The second classification, chemical weathering, involves the direct effect of atmospheric chemicals or biologically produced chemicals also known as biological weathering in the breakdown of rocks, soils and minerals. While physical weathering is accentuated in very cold or very dry environments, chemical reactions are most intense where the climate is wet and hot. However, both types of weathering occur together, and each tends to accelerate the other. For example, physical abrasion (rubbing together) decreases the size of particles and therefore increases their surface area, making them more susceptible to chemical reactions. The various agents act in concert to convert primary minerals (feldspars and micas) to secondary minerals (clays and carbonates) and release plant nutrient elements in soluble forms. The materials left over after the rock breaks down combined with organic material creates soil. The mineral content of the soil is determined by the parent material; thus, a soil derived from a single rock type can often be deficient in one or more minerals needed for good fertility, while a soil weathered from a mix of rock types (as in glacial, aeolian or alluvial sediments) often makes more fertile soil. In addition, many of Earth's landforms and landscapes are the result of weathering processes combined with erosion and re-deposition. Physical weathering, also called mechanical weathering or disaggregation, is the class of processes that causes the disintegration of rocks without chemical change. The primary process in physical weathering is abrasion (the process by which clasts and other particles are reduced in size). However, chemical and physical weathering often go hand in hand. Physical weathering can occur due to temperature, pressure, frost etc. For example, cracks exploited by physical weathering will increase the surface area exposed to chemical action, thus amplifying the rate of disintegration. Abrasion by water, ice, and wind processes loaded with sediment can have tremendous cutting power, as is amply demonstrated by the gorges, ravines, and valleys around the world. In glacial areas, huge moving ice masses embedded with soil and rock fragments grind down rocks in their path and carry away large volumes of material. Plant roots sometimes enter cracks in rocks and pry them apart, resulting in some disintegration; the burrowing of animals may help disintegrate rock. However, such biotic influences are usually of little importance in producing parent material when compared to the drastic physical effects of water, ice, wind, and temperature change. Thermal stress weathering, sometimes called insolation weathering,  results from the expansion and contraction of rock, caused by temperature changes. For example, heating of rocks by sunlight or fires can cause expansion of their constituent minerals. As some minerals expand more than others, temperature changes set up differential stresses that eventually cause the rock to crack apart. Because the outer surface of a rock is often warmer or colder than the more protected inner portions, some rocks may weather by exfoliation – the peeling away of outer layers. This process may be sharply accelerated if ice forms in the surface cracks. When water freezes, it expands with a force of about 1465 Mg/m^2, disintegrating huge rock masses and dislodging mineral grains from smaller fragments. Thermal stress weathering comprises two main types, thermal shock and thermal fatigue. Thermal stress weathering is an important mechanism in deserts, where there is a large diurnal temperature range, hot in the day and cold at night. The repeated heating and cooling exerts stress on the outer layers of rocks, which can cause their outer layers to peel off in thin sheets. The process of peeling off is also called exfoliation. Although temperature changes are the principal driver, moisture can enhance thermal expansion in rock. Forest fires and range fires are also known to cause significant weathering of rocks and boulders exposed along the ground surface. Intense localized heat can rapidly expand a boulder. The thermal heat from wildfire can cause significant weathering of rocks and boulders, heat can rapidly expand a boulder and thermal shock can occur. The differential expansion of a thermal gradient can be understood in terms of stress or of strain, equivalently. At some point, this stress can exceed the strength of the material, causing a crack to form. If nothing stops this crack from propagating through the material, it will result in the object's structure to fail. Frost weathering, also called ice wedging or cryofracturing, is the collective name for several processes where ice is present. These processes include frost shattering, frost-wedging and freeze–thaw weathering. Severe frost shattering produces huge piles of rock fragments called scree which may be located at the foot of mountain areas or along slopes. Frost weathering is common in mountain areas where the temperature is around the freezing point of water. Certain frost-susceptible soils expand or heave upon freezing as a result of water migrating via capillary action to grow ice lenses near the freezing front. This same phenomenon occurs within pore spaces of rocks. The ice accumulations grow larger as they attract liquid water from the surrounding pores. The ice crystal growth weakens the rocks which, in time, break up. It is caused by the approximately 10% (9.87) expansion of ice when water freezes, which can place considerable stress on anything containing the water as it freezes. Freeze induced weathering action occurs mainly in environments where there is a lot of moisture, and temperatures frequently fluctuate above and below freezing point, especially in alpine and periglacial areas. An example of rocks susceptible to frost action is chalk, which has many pore spaces for the growth of ice crystals. This process can be seen in Dartmoor where it results in the formation of tors. When water that has entered the joints freezes, the ice formed strains the walls of the joints and causes the joints to deepen and widen. When the ice thaws, water can flow further into the rock. Repeated freeze–thaw cycles weaken the rocks which, over time, break up along the joints into angular pieces. The angular rock fragments gather at the foot of the slope to form a talus slope (or scree slope). The splitting of rocks along the joints into blocks is called block disintegration. The blocks of rocks that are detached are of various shapes depending on rock structure. Coastal geography is formed by the weathering of wave actions over geological times or can happen more abruptly through the process of salt weathering. 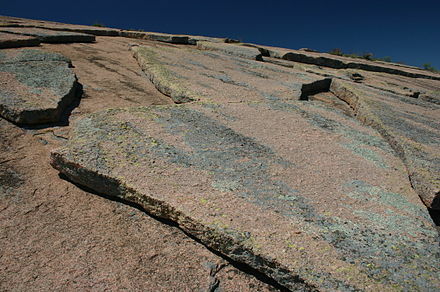 Pressure release could have caused the exfoliated granite sheets shown in the picture. In pressure release, also known as unloading, overlying materials (not necessarily rocks) are removed (by erosion, or other processes), which causes underlying rocks to expand and fracture parallel to the surface. Intrusive igneous rocks (e.g. granite) are formed deep beneath the Earth's surface. They are under tremendous pressure because of the overlying rock material. When erosion removes the overlying rock material, these intrusive rocks are exposed and the pressure on them is released. The outer parts of the rocks then tend to expand. The expansion sets up stresses which cause fractures parallel to the rock surface to form. Over time, sheets of rock break away from the exposed rocks along the fractures, a process known as exfoliation. Exfoliation due to pressure release is also known as "sheeting". Retreat of an overlying glacier can also lead to exfoliation due to pressure release. Tafoni at Salt Point State Park, Sonoma County, California. Salt crystallization, the weathering by which is known as haloclasty, causes disintegration of rocks when saline solutions seep into cracks and joints in the rocks and evaporate, leaving salt crystals behind. These salt crystals expand as they are heated up, exerting pressure on the confining rock. Salt crystallization may also take place when solutions decompose rocks (for example, limestone and chalk) to form salt solutions of sodium sulfate or sodium carbonate, of which the moisture evaporates to form their respective salt crystals. The salts which have proved most effective in disintegrating rocks are sodium sulfate, magnesium sulfate, and calcium chloride. Some of these salts can expand up to three times or even more. Salt crystallization is normally associated with arid climates where strong heating causes strong evaporation and therefore salt crystallization. It is also common along coasts. An example of salt weathering can be seen in the honeycombed stones in sea wall. 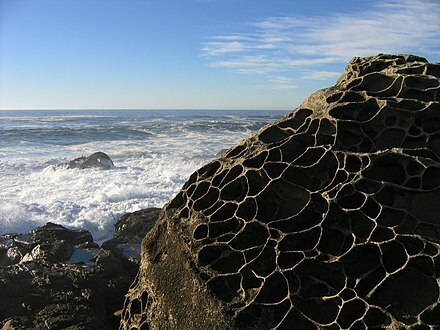 Honeycomb is a type of tafoni, a class of cavernous rock weathering structures, which likely develop in large part by chemical and physical salt weathering processes. Living organisms may contribute to mechanical weathering, as well as chemical weathering (see § Biological weathering below). 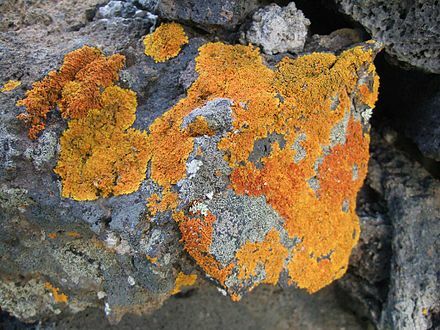 Lichens and mosses grow on essentially bare rock surfaces and create a more humid chemical microenvironment. The attachment of these organisms to the rock surface enhances physical as well as chemical breakdown of the surface microlayer of the rock. On a larger scale, seedlings sprouting in a crevice and plant roots exert physical pressure as well as providing a pathway for water and chemical infiltration. 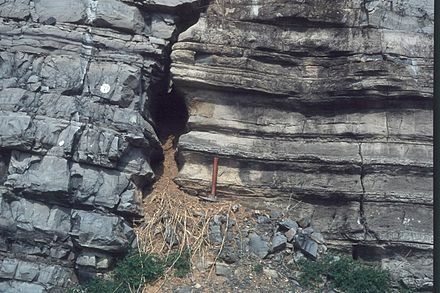 Comparison of unweathered (left) and weathered (right) limestone. Chemical weathering changes the composition of rocks, often transforming them when water interacts with minerals to create various chemical reactions. Chemical weathering is a gradual and ongoing process as the mineralogy of the rock adjusts to the near surface environment. New or secondary minerals develop from the original minerals of the rock. In this the processes of oxidation and hydrolysis are most important. Chemical weathering is enhanced by such geological agents as the presence of water and oxygen, as well as by such biological agents as the acids produced by microbial and plant-root metabolism. 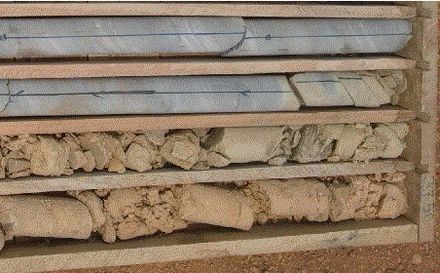 Limestone core samples at different stages of chemical weathering (due to tropical rain and underground water), from very high at shallow depths (bottom) to very low at greater depths (top). Slightly weathered limestone shows brownish stains, while highly weathered limestone transformed into clay. Underground limestone from the carbonate West Congolian deposit in Kimpese, Democratic Republic of Congo. Rainfall is acidic because atmospheric carbon dioxide dissolves in the rainwater producing weak carbonic acid. In unpolluted environments, the rainfall pH is around 5.6. Acid rain occurs when gases such as sulfur dioxide and nitrogen oxides are present in the atmosphere. These oxides react in the rain water to produce stronger acids and can lower the pH to 4.5 or even 3.0. Sulfur dioxide, SO2, comes from volcanic eruptions or from fossil fuels, can become sulfuric acid within rainwater, which can cause solution weathering to the rocks on which it falls. Some minerals, due to their natural solubility (e.g. evaporites), oxidation potential (iron-rich minerals, such as pyrite), or instability relative to surficial conditions (see Goldich dissolution series) will weather through dissolution naturally, even without acidic water. One of the most well-known solution weathering processes is carbonation, the process in which atmospheric carbon dioxide leads to solution weathering. Carbonation occurs on rocks which contain calcium carbonate, such as limestone and chalk. This takes place when rain combines with carbon dioxide or an organic acid to form a weak carbonic acid which reacts with calcium carbonate (the limestone) and forms calcium bicarbonate. This process speeds up with a decrease in temperature, not because low temperatures generally drive reactions faster, but because colder water holds more dissolved carbon dioxide gas. Carbonation is therefore a large feature of glacial weathering. Carbonation on the surface of well-jointed limestone produces a dissected limestone pavement. This process is most effective along the joints, widening and deepening them. Mineral hydration is a form of chemical weathering that involves the rigid attachment of H+ and OH- ions to the atoms and molecules of a mineral. When rock minerals take up water, the increased volume creates physical stresses within the rock. For example, iron oxides are converted to iron hydroxides and the hydration of anhydrite forms gypsum. This reaction theoretically results in complete dissolution of the original mineral, if enough water is available to drive the reaction. In reality, pure water rarely acts as a H+ donor. Carbon dioxide, though, dissolves readily in water forming a weak acid and H+ donor. This hydrolysis reaction is much more common. Carbonic acid is consumed by silicate weathering, resulting in more alkaline solutions because of the bicarbonate. This is an important reaction in controlling the amount of CO2 in the atmosphere and can affect climate. Aluminosilicates when subjected to the hydrolysis reaction produce a secondary mineral rather than simply releasing cations. Within the weathering environment chemical oxidation of a variety of metals occurs. The most commonly observed is the oxidation of Fe2+ (iron) and combination with oxygen and water to form Fe3+ hydroxides and oxides such as goethite, limonite, and hematite. This gives the affected rocks a reddish-brown coloration on the surface which crumbles easily and weakens the rock. This process is better known as 'rusting', though it is distinct from the rusting of metallic iron. Many other metallic ores and minerals oxidize and hydrate to produce colored deposits, such as chalcopyrites or CuFeS2 oxidizing to copper hydroxide and iron oxides. Biological weathering of basalt by lichen, La Palma. The symbiotic mycorrhizal fungi associated with tree root systems can release inorganic nutrients from minerals such as apatite or biotite and transfer these nutrients to the trees, thus contributing to tree nutrition. It was also recently evidenced that bacterial communities can impact mineral stability leading to the release of inorganic nutrients. To date a large range of bacterial strains or communities from diverse genera have been reported to be able to colonize mineral surfaces or to weather minerals, and for some of them a plant growth promoting effect was demonstrated. The demonstrated or hypothesised mechanisms used by bacteria to weather minerals include several oxidoreduction and dissolution reactions as well as the production of weathering agents, such as protons, organic acids and chelating molecules. Buildings made of any stone, brick or concrete are susceptible to the same weathering agents as any exposed rock surface. Also statues, monuments and ornamental stonework can be badly damaged by natural weathering processes. This is accelerated in areas severely affected by acid rain. Three groups of minerals often remain in well-weathered soils: silicate clays, very resistant end products including iron and aluminium oxide clays, and very resistant primary minerals such as quartz. In highly weathered soils of humid tropical and subtropical regions, the oxides of iron and aluminium, and certain silicate clays with low Si/Al ratios, predominate because most other constituents have been broken down and removed. Salt weathering of sandstone near Qobustan, Azerbaijan. This Permian sandstone wall near Sedona, Arizona, United States has weathered into a small alcove. Look up weathering in Wiktionary, the free dictionary. Wikimedia Commons has media related to Weathering . ↑ Paradise, T. R. (2005). 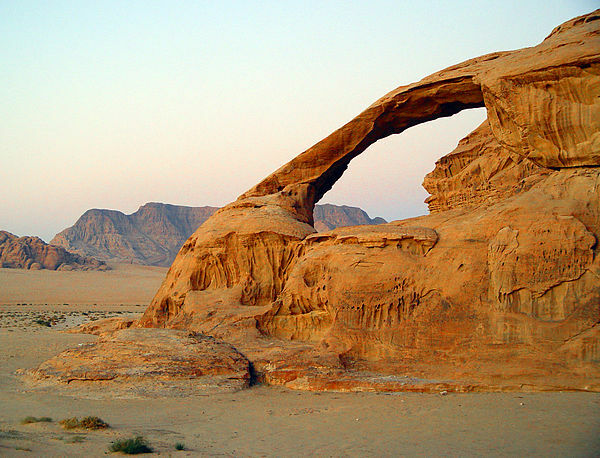 "Petra revisited: An examination of sandstone weathering research in Petra, Jordan". Special Paper 390: Stone Decay in the Architectural Environment. 390. pp. 39–49. doi:10.1130/0-8137-2390-6.39. ISBN 0-8137-2390-6. ↑ Taber, Stephen (1930). "The mechanics of frost heaving" (PDF). Journal of Geology. 38 (4): 303–315. Bibcode:1930JG.....38..303T. doi:10.1086/623720. ↑ Goudie, A.S.; Viles H. (2008). "5: Weathering Processes and Forms". In Burt T.P. ; Chorley R.J.; Brunsden D.; Cox N.J.; Goudie A.S. Quaternary and Recent Processes and Forms. Landforms or the Development of Gemorphology. 4. Geological Society. pp. 129–164. ISBN 1-86239-249-8. ↑ Zambell, C.B. ; Adams, J.M. ; Gorring, M.L. ; Schwartzman, D.W. (2012). "Effect of lichen colonization on chemical weathering of hornblende granite as estimated by aqueous elemental flux". Chemical Geology. 291: 166–174. Bibcode:2012ChGeo.291..166Z. doi:10.1016/j.chemgeo.2011.10.009. ↑ Chapin III, F. Stuart; Pamela A. Matson; Harold A. Mooney (2002). Principles of terrestrial ecosystem ecology ([Nachdr.] ed.). New York: Springer. pp. 54–55. ISBN 9780387954431. ↑ Waugh, David (2000). Geography : an integrated approach (3rd ed.). Gloucester, U.K.: Nelson Thornes. p. 272. ISBN 9780174447061. ↑ Landeweert, R.; Hoffland, E.; Finlay, R.D. ; Kuyper, T.W. ; van Breemen, N. (2001). "Linking plants to rocks: Ectomycorrhizal fungi mobilize nutrients from minerals". Trends in Ecology & Evolution. 16 (5): 248–254. doi:10.1016/S0169-5347(01)02122-X. PMID 11301154. ↑ Calvaruso, C.; Turpault, M.-P.; Frey-Klett, P. (2006). "Root-Associated Bacteria Contribute to Mineral Weathering and to Mineral Nutrition in Trees: A Budgeting Analysis". Applied and Environmental Microbiology. 72 (2): 1258–66. doi:10.1128/AEM.72.2.1258-1266.2006. PMC 1392890 . PMID 16461674. ↑ Uroz, S.; Calvaruso, C.; Turpault, M.-P.; Frey-Klett, P. (2009). "Mineral weathering by bacteria: ecology, actors and mechanisms". Trends Microbiol. 17 (8): 378–87. doi:10.1016/j.tim.2009.05.004. PMID 19660952.